Coordinators: Watson Ronald Ross, Preedy Victor R.
The role of diet in the prevention, control and treatment of diabetes continues to provide significant opportunity for non-pharmaceutical interventions for the estimated 220 million people worldwide affected by this disease. Looking beyond traditional dietary controls may lead to more effective, cost-efficient, and flexible options for many patients. 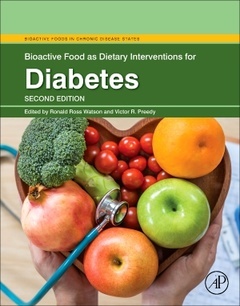 Bioactive Food as Dietary Interventions for Diabetes, Second Edition is a valuable scientific resource focused on exploring the latest advances in bioactive food research, and the potential benefit of bioactive food choice on diabetic condition. Written by experts from around the world, it presents important information that can help improve the health of those at risk for diabetes and diabetes related conditions using food selection as its foundation. An important resource for those involved in the dietary and nutritional care of diabetic patients as well as researchers seeking information on alternative bioactive food-based solutions. Nutritionists, Dieticians, Health scientists/researchers whose focus is in identifying pre-diabetes symptoms, diabetes, and its relationship to obesity and weight issues. Food scientists targeting health-related product development.